Indulge your skin and delight your senses with Softsoap Juicy Pomegranate & Mango Infusions Moisturizing Body Wash. 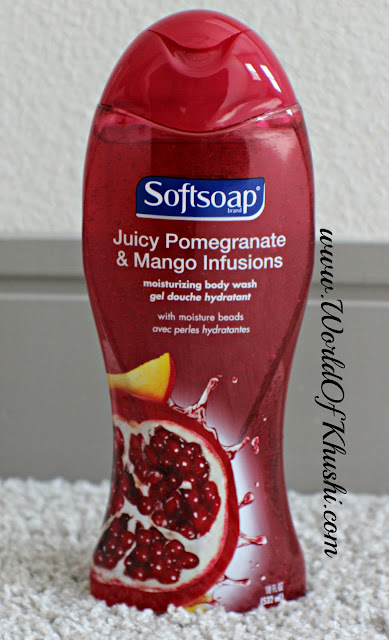 The ripe scent of juicy pomegranate and mango are your perfect escape. Infused with pomegranate extract, known as nature's antioxidant rich fruit, this body wash leaves skin fresh and moisturized. Treat your skin with natural extracts and specially formulated moisture beads. - Moisturizing Body Wash with Moisture Beads. - Energizing and Refreshing Fragrance. 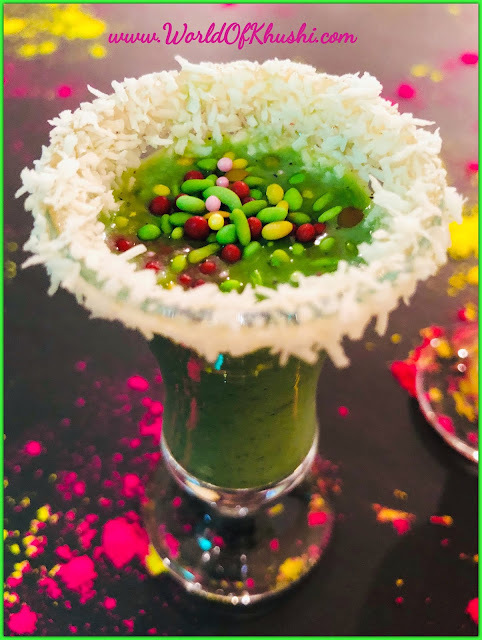 - Infused with Pomegranate Extract. Squeeze a small amount onto a wet body pouf and indulge yourself in the frangrant, moisture-rich lather. It comes in Red Long Plastic Bottle with flip cap. The texture is gel like consistency with light red in color and also have very small beads. 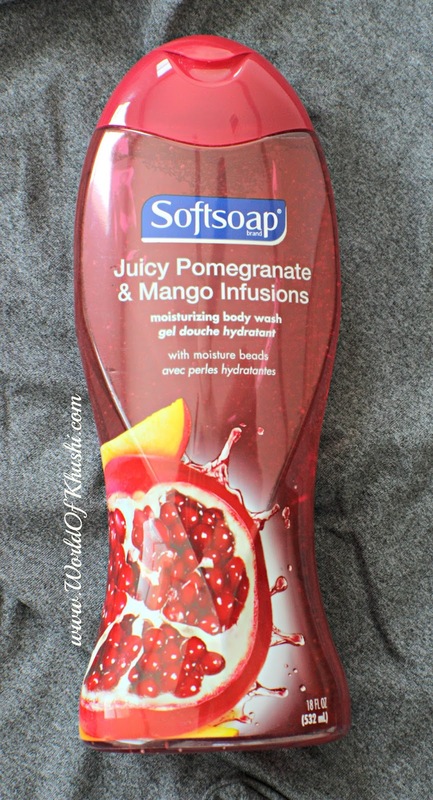 It smells like Mangoes and Pomegranate, very refreshing. Beautifully lather and makes skin soft. You don't need too much product, little goes a long way. 3. Smell is very refreshing. 5. Little goes a long way. 6. Smells like high-end washes. 7. Packaging is simple and easy to use. 8. Although it's large in size but I can still say it's travel friendly as it does not has pump packaging. I didn't find any problem. Like to try other products too from Softsoap range. Overall!! I love this Body Wash, it's smells nice and does the job very well. In less price you get large quantity with good quality. I love to try other Body Washes from Softsoap range. I highly recommended to you people. 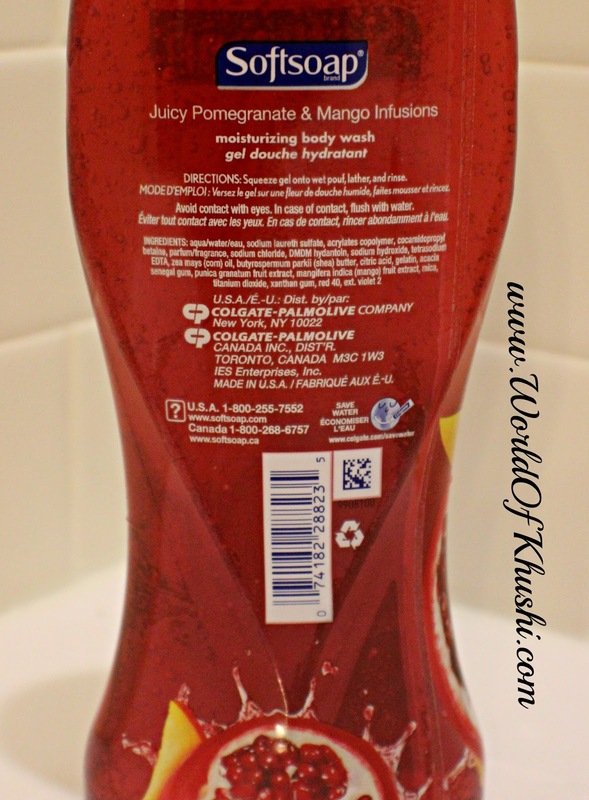 This is my full Review for Softsoap Juicy Pomegranate & Mango Infusions Moisturizing Body Wash.